Amousinded.info is the PUP that uses misleading techniques to prevent removal. Use Reimage to locate malicious components and get rid of them faster than with uninstall instructions. A full system scan blocks virus reappearance and prevents traffic to malicious domains. Amousinded.info is another push notification virus (or allow notifications scam) that is initiated by adware installed on victims' computers. Adware is deceptive software that focuses on advertisement revenue and spams Google Chrome, Internet Explorer, Mozilla Firefox, Safari and other browsers with pop-up ads and redirects. The unwanted application usually gets installed together with other software that users download from the internet and install it by using Recommended/Quick settings. Therefore, the infiltration is generally unnoticed, although the symptoms of Amousinded.info infections can be spotted straight aware. The infected users are often redirected to pages like dh4q.amousinded.info and asked to allow notifications in order to view the content. It is not recommended clicking on any of the options, and take care or Amousinded.info termination instead. Usually, adware is not dangerous by itself. However, the dubious infiltration techniques, redirects to suspicious websites, web browser settings modifications without permission and similar traits can make adware just as dangerous as malware. Therefore, it is vital to remove Amousinded.info virus from your PC as soon as possible. You can either take a look at our instructions below or use security software that specializes in PUP elimination. 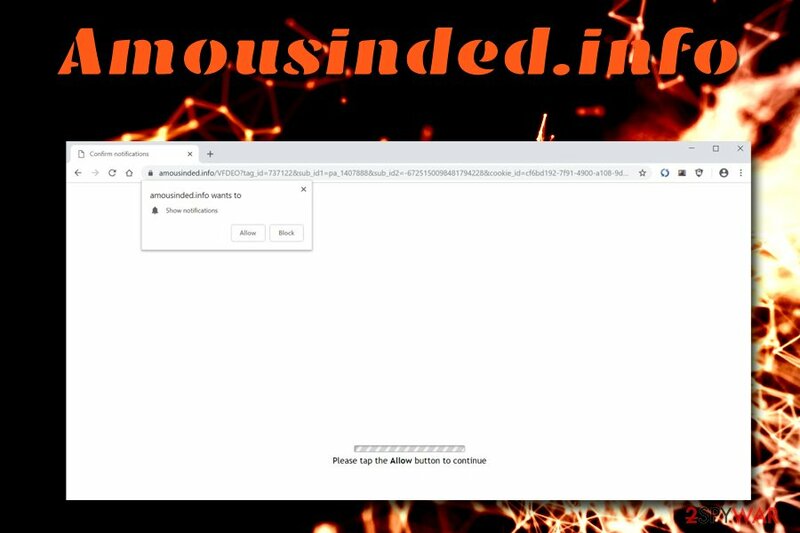 Note that Amousinded.info pop-up appearance not necessarily means any sort of infection, because you can simply be redirected from a malicious website. In such a case, simply shut down the newly opened tab and perform a scan with Reimage or other security software just to be sure. Some users might be surprised by a redirect, especially if they never encountered a push notification virus before (such as Codeprogressee.info, Ncontentdelivery.info, Nuclearlytu.info, and many others. These type of social engineering attacks became extremely popular in recent months, as they seem to be especially effective. Once Amousinded.info notifications are allowed, users will be forced to see pop-up ads that can lead to phishing, spam, malware-laden, or other dangerous websites. 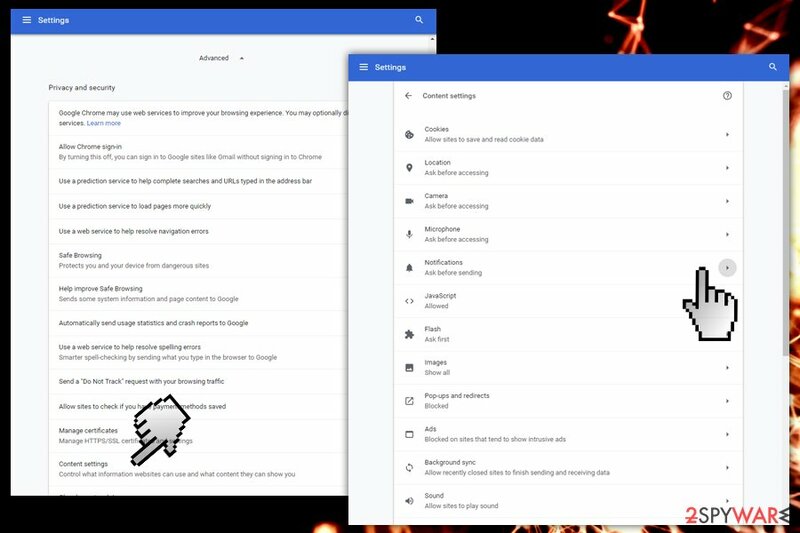 The only way to stop these messages is by performing Amousinded.info removal and resetting the browser or stopping notifications. If you see Amousinded.info pop-ups on your browser, do not ignore them, as it can compromise your virtual safety and computer security. Adware is usually propagated with the help of other free software. Freeware developers often choose pay-per-install scheme when they collaborate with other software authors. Unfortunately, that “other software” is usually unsafe so bundled software should not be overlooked. Unfortunately, some people are still unaware of this questionable distribution technique which results in many users wondering why are their browsers acting negatively. Select Advanced settings and remove all the ticks next to add-ons, media players, file converters, system optimization software, and similar useless programs. Fortunately, Amousinded.info removal should not be a complicated task. You can follow our detailed instructions below: eliminate all suspicious entries first and then reset each of the affected browsers. However, if you have been suffering from invasive ads, persistent redirects, slow browser, lagging computer and similar issues, we highly advise you download and install security software and remove Amousinded.info and any other PUPs/malware on your PC. Here, look for Amousinded.info or any other recently installed suspicious programs. Wait until you see Applications folder and look for Amousinded.info or any other suspicious programs on it. Now right click on every of such entries and select Move to Trash. When in the new window, check Delete personal settings and select Reset again to complete Amousinded.info removal. Once these steps are finished, Amousinded.info should be removed from your Microsoft Edge browser. Here, select Amousinded.info and other questionable plugins. Click Remove to delete these entries. Now you will see Reset Firefox to its default state message with Reset Firefox button. Click this button for several times and complete Amousinded.info removal. Here, select Amousinded.info and other malicious plugins and select trash icon to delete these entries. Click Reset to confirm this action and complete Amousinded.info removal. Here, select Extensions and look for Amousinded.info or other suspicious entries. Click on the Uninstall button to get rid each of them. Now you will see a detailed dialog window filled with reset options. All of those options are usually checked, but you can specify which of them you want to reset. Click the Reset button to complete Amousinded.info removal process. ^ Adware. Trend Micro. Security Blog. ^ Vangie Beal. Web beacon. Webopedia. Online Tech Dictionary. ^ ZonderVirus. ZonderVirus. Cybersecurity experts. This entry was posted on 2018-11-29 at 05:04 and is filed under Adware, Viruses. You can quickly scan the QR code with your mobile device and have Amousinded.info manual removal instructions right in your pocket. How did you remove Amousinded.info?